Woking travel to local rivals Aldershot Town on Boxing Day and will be hoping for a repeat of last season’s success against The Shots. After recording wins against Gateshead and Bromley, Woking fans would have hoped that Garry Hill’s side would have pushed on. However, Cup and Trophy disappointment followed and with Woking failing to beat Guiseley last time out in the league, Cards fans are again looking at the shrinking gap to the relegation zone (just goal difference is keeping Woking above the line). If you listen to football folklore then form goes out of the window in derby games. This statement will be music to the ears of both Cards and Shots fans as both sides have been struggling of late. We caught up with Tommy Anderson, Chairman of The Shots Trust, to find out what we can expect on Boxing Day. It’s been a while since we played each other and since we last met there was quite a big summer for The Shots off the pitch with Gary Waddock returning to the club. Fans must have been delighted to see him return? There were big changes at Aldershot back in the summer both on the playing side and of course the return of Gary Waddock as manager which was just what the club needed! Season ticket sales rose dramatically following Gary’s return, a good, competitive squad was assembled and our start to the season was extremely encouraging. Our recent form has dipped and cup exits in the FA Cup and FA Trophy at the hands of lower opposition was disappointing, no question about that, however I think we need to be realistic and honest and say if 10th position was offered to us back in June at this present time, we would have had accepted it. From a personal point of view, I am content overall with how the season has panned out. I expect the squad to bounce back from recent disappointments and improve as the season goes on and put pressure on the teams above. A few other additions included Scott Rendell and Jake Cole from Woking. How have both players settled in at The Rec? They’ve done ok. Jake Cole in particular has significantly improved us in the goalkeeping position. Earlier on in the season, he made some crucial saves at key times in games to preserve our lead, he offers big assurances to the defenders ahead of him with his talking and direction, a real leader. Scott Rendell for me is slowly getting better and better, the goals haven’t produced what he had done previous, this is down to mostly being played in a deeper position and also people need to realise that this season he came back from a cruciate ligament injury that put him out of action for all of last season, arrived at Aldershot and played lots of games in a short space of time and was clearly shattered! However, Scott has now really worked on his fitness and is looking sharper and sharper and I’m fully confident that the goals will flow in the not so distant future. It has been an up and down season so far for yourselves with disappointment in the FA Cup and Trophy (similar to Woking!) but a steady mid-table position has been maintained. There have been a few big results in there too. How do you think things are working out and are the play-offs the aim? Overall, I’m fairly content with how the season has panned out. Major disappointments in exiting both cup competitions early and for clubs like ourselves, there is a lot of financial gain to be had from a decent run in both competitions, however our league campaign has been a vast improvement on recent years, we are playing an entertaining, attacking style of football which we long sought for at the a EBB Stadium! Early doors, we started in superb fashion scoring plenty of goals and putting good sides under the sword! However, like all clubs, we are currently on a disappointing run of results and that needs to be addressed quickly. We now have a perfect chance with the next two fixtures to get our season back on track and to make an almighty push for the play-offs which for me has to always be the target, despite the fact it would be an overachievement on our budget for that to happen this season. Who will Woking have to watch out for on Boxing Day? Jake Gallagher – A tenacious, hardworking player who now plays in a further forward role since Gary’s arrival and has an attacking edge about him that not a lot of people would expect him to have. A player that always gives 100% and from speaking to him in the week, he is completely fired up and ready for the festive fixtures! Idris Kanu – A highly rated youngster who is attracting plenty of interest higher up the football pyramid certainly has the game to create and muster chances and goals out of nothing. With the TV cameras circulating the EBB Stadium on the 26th, Idris will see this as a fine chance to impress and put a statement out to the interested suitors. Scott Rendell – Scott will be relishing coming up against his former side and will be really chomping at the bit to get his goalscoring boots firing. A natural finisher who certainly has plenty of goals left in the tank and always one for any team to watch out for. I’m predicting Aldershot Town to get back to winning ways, after last year’s disappointing matches against Woking. It’s time for us to attempt to get the double crown back! Woking will certainly cause problems and come with a game plan but I’m backing Aldershot to win 3-1! Photos by David Holmes. For a full set go to wokingfc.co.uk. Woking travel to the Deva Stadium on Saturday looking for their first win of the season when they take on newly promoted Chester. We talked to Chester supporter Chris Graham to find out more about the side from the north-west, who are also looking for their first victory of the new campaign. Hi Chris, After a massively successful season last year, where you set the Conference North record for: Highest points total (107), most wins in a season (34), fewest defeats in a season (3), most goals scored (103) and best goal difference (+71), what are your realistic ambitions for this season? A- It’s been a very strange offseason, obviously confidence was sky high after breaking so many records last season but since the end the season there have been a lot of changes. The squad that broke those records has pretty much been split up, with only a handful of players remaining. This has made it difficult to know what to expect, with plenty of new faces in. Realistically I think that most Blues fans would be happy settling for a mid table finish going into the season, and despite the tough start I think that a lot of people are realising just how difficult this season will be. Like Woking you’re yet to register your first win and also like Woking you’re still looking for your first league goal of the new campaign, have you just been unlucky or shall we prepare ourselves for a bore draw? A- In the two games we’ve played so far we’ve been comfortable up until half time, then gone and thrown it all away (conceding against Barnet in the 46th minute and vs Hereford in first half injury time). The team is still trying to find its identity and gel together so there have been a few errors at the back that have lead to silly goals while up top we’re struggling to create chances. I think the biggest gap at present has been the loss of Antoni Sarcevic, sold to Fleetwood in the summer, as he was such a huge part of the teams attacking play. At present it seems that the plan is to go long towards the channels and getting plenty of crosses into the penalty area but so far it’s not been successful and because of this I think there may just be the solitary goal in it. How have you found the difference in standard between the Conference North and Premier in your opening two matches (Barnet & Hereford)? A- Personally I think it’s probably one of the biggest steps up between any division, in the North there is far more time on the ball than in the Premier, the other big difference I’ve noticed is that the strikers in the Premier division are far more clinical. Obviously the fact that there are so many full time clubs makes it even more difficult, but I think that part time clubs have shown that if they get it right then there are opportunities for those clubs to do well. Given the start the club have been handed, with trips to Kidderminster and the local derby against Wrexham split with a game against Forest Green on Bank Holiday Monday still to come, then the club may have somewhat a false position early doors before coming back strong as the season progresses. 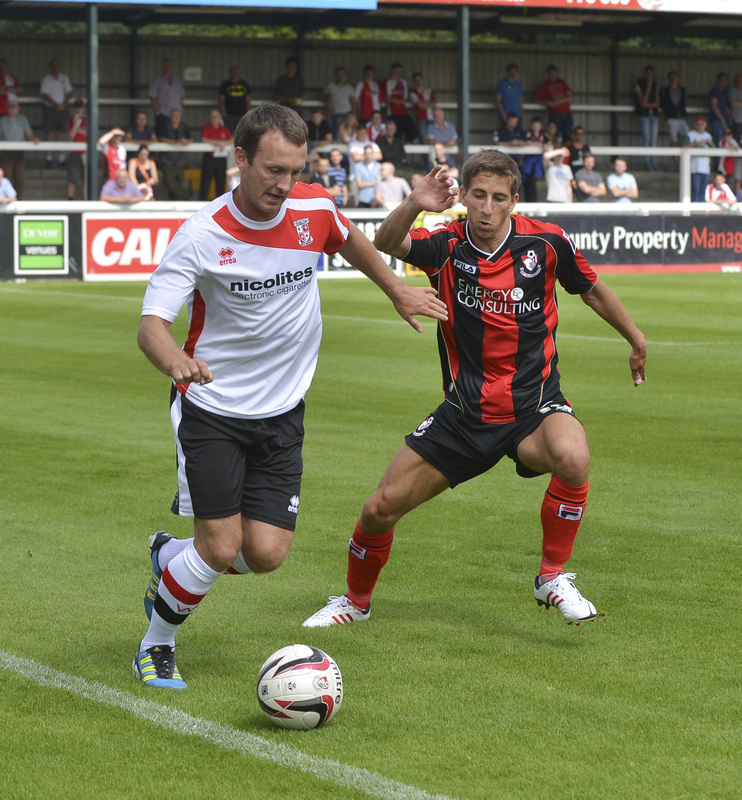 What players will pose the biggest threat to Woking on Saturday? A- I think the sides pretty unbalanced at the moment, almost all the positive play going forward so far has been down the right wing, where Craig Lindfield and Leeds Loanee Lewis Turner have linked up well. Also watch out for Lewis’ identical twin, Nathan, in the centre of the park as he’s full of energy. As mentioned earlier, expect plenty of crosses into the area, most likely to come from Lindfield and left back, Kevin McIntyre, both of whom are also good from dead ball situations. Up top Gareth Seddon has started brightest of the strikers, looking lively and chasing down chances but if Alex Titchiner is passed fit then may be given the nod ahead of Jamie Reed. Titchiner’s pace is something that Blues fans feel they have been missing so far this season and a lot of hopes have been pinned on the Fleetwood man in getting the club off the mark. Finally, what is your score prediction for Saturday? A- Despite the difficult start for the club so far I’m still going to have to stay loyal and predict three points for the Blues. I don’t think there will be much in it though, so I’m thinking 1-0 to Chester. At this point I think it’s more about the result than the performance though I think both Lewis and Nathan Turner will both have strong games and Gareth Seddon scoring the only goal of the game. Woking today confirmed that they have re-signed forward Gavin McCallum after an impressive pre-season and Gavin Williams who was a free agent after leaving newly promoted Yeovil Town at the end of last season. spent two and a half years at Ashton Gate, so we talked to Robins fan Liam Horler (@Liam_Horler) to find out more on Woking’s new forward. Q. What position/positions did he play for Bristol City? Gavin was often deployed on the right hand side of midfield for Bristol City, this was one of the reasons why he didn’t have perhaps the impact on the team that he could have had he been played in a different position. The times that he played as a central-attacking midfielder in a midfield of five was when he was at his best. But because then manager, Gary Johnson was keen to play two strikers and a midfield four, Gavin would often find himself on the bench, rather than played as one of the two central midfielders, mainly because Johnson didn’t trust his tackling ability, which is crucial in a midfield two the Championship. Q. What are his strengths and weaknesses? Williams’ main strengths are his dribbling ability and ball control. He often used to skip through two or three players in a central position in the opposition half with what seemed like ease. He’s also known to like a shot on goal. Don’t be disheartened by the fact he only scored three goals for City (most of his 52 appearances came as a substitute). A 30 yard volley against Derby County at Pride Park right in front of the City fans sticks in my mind but if you’d ask most Robins fans “Which Gavin Williams goal do you remember the most?” They would no doubt say his last minute equaliser against Cardiff City in the FA Cup (for different reasons!) He is also a terrific passer of the ball. I’d say Williams had two weaknesses during his time that I watched him at Ashton Gate. Firstly his lack of pace hindered him a little bit in a very quick league but this might not be as much of an issue making the step down to the conference. Secondly he is a little bit ‘light weight’ and used to get shrugged off of the ball sometimes but when in a free role between the midfield and strikers this wasn’t too much of a problem. Another thing which stuck out for me whilst watching Williams was that he is very much a confidence player. When he’s happy with his game and the team are winning he was a joy to watch (he linked up very well with Lee Trundle whilst the two were together at the club) but when the team are on the back foot he does have the tendency to go missing somewhat. Q. Will he be remembered as a player who never fulfilled his potential with yourselves due to injuries? Yes, I couldn’t have put it better myself! His injuries along with Gary Johnson not really being able to put him in his best position were the only thing that stopped him fulfilling his potential with City, he no doubt had the talent. Q. Bearing in mind he has dropped down into non-league, do you think he could be a stand out player? I’ll be honest in saying I haven’t watched too much Conference football and I obviously haven’t seen Williams play since 2010, when he was 29 years of age. But I wouldn’t have thought he would have lost too much of his ‘spark’ in three years. If Gavin stays injury-free and keeps his confidence high I have no doubt that he will be one of the stand out players not just for Woking but in the whole league. Q. Not many players go from City to Rovers, was this a move that disappointed you and other fans? Not many players swap Bristol allegiances without playing for a few clubs before but Gavin was one that did that. This didn’t disappoint me as much as it would have if Bristol Rovers were in the same division as City and if he’d left us for what he thought was a better challenge. He was released by us, because Gary Johnson decided to spend some money to bring in what he thought were better players, this left Gavin surplus to requirements and the fact that he was released rather than officially transferred from us to them made the blow a little softer. Gavin is also a nice man and very professional player who works hard for the team, bear in mind that he’s a Cardiff City fan and obviously joined Bristol Rovers so for Bristol City fans to respect him shows he put in a lot of effort for the shirt. If Gavin Williams came back to Ashton Gate in an opposition shirt (Woking against Bristol City in the FA Cup first round this season? You never know), he would certainly not be jeered; in fact he’d probably get a very good reception. I shall look out for how Gavin gets on this season; you’ve got yourselves a very talented player.